These are amazing. Not too tricky, not too cakey, not too chewy. Word of caution, though: they’re rich enough that it’s tough to eat more than one, so they’re the kind of cookie you leave out all afternoon so people can recover from them a bit before they go for another one. The only marginally tricky part is melting the chocolate, but I tried the on-the-stove option (what my mom calls a “bain marie“), and it was easy & involved no mess-ups. See the bottom of the recipe for microwave & stovetop chocolate-melting instructions. Mix together flour, cocoa, baking powder, salt; sift into a small or medium bowl & set aside. Melt chocolate (see below). Meanwhile, gently beat together eggs, vanilla & espresso powder. Set aside. Beat butter until creamy. Beat in sugars until thoroughly mixed (will be granular). Add melted chocolate in a steady stream, mixing vigorously or beating on low until just combined. Scrape bowl. Add dry ingredients on low, scraping frequently and mixing JUST until combined. Mix will be goopy. If making triple chocolate, mix in chips now. Mix will be very wet. Cover and set aside at room temperature 30 minutes so that mix can thicken up to a shapeable texture. Line 2 baking sheets with parchment paper and scoop out dough balls NO SMALLER than a golf ball (they won’t be chewy if you make them smaller). Space 1 1/2 in apart. Bake 8-10 min; at 4 min, switch top & bottom sheets and rotate sheets front to back. Edges should have just barely begun to set, but centers should still be very soft. Cool 10 min on baking sheets, then on baking racks (or all the way on the parchment paper on a non-plastic counter). Microwave: cook 2 min at 50% power, stir, then cook 1 min more at 50%. Stovetop: fill a small or medium saucepan 1/3 full of water, bring nearly to a simmer, and leave at low or just above low heat. Place a heat-safe bowl on top so it nestles in the saucepan with its bottom an inch or two into the water. Place chocolate in the bowl and let it sit several minutes, until the edges are noticeably wet. Stir once. Continue to let it sit. If water makes boiling or simmering noises, lower heat and check to make sure it hasn’t boiled away (lift the far edge of the bowl, not the one near you, or the steam may burn). When the melted area has progressed an inch or more toward the middle of the chocolate, stir again and then continue to let sit until all chocolate has melted. Remove from heat, stir, and set aside. 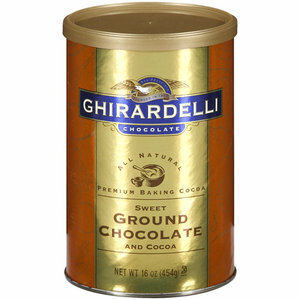 For the cocoa, I couldn’t find anything claiming to be Dutch-processed, so I used Ghirardelli’s sweet ground chocolate. Don’t use Nesquick or instant hot chocolate mix; those have evaporated milk and tons of other stuff in them that will make your cookies cakier and way less chocolatey! For the 16oz I used 2 packages of Baker’s squares, but if you want to go for quality over price, the America’s Test Kitchen people say to use Callebaut (best), or the bars of Ghirardelli (2nd-best). It’s better not to substitute chips for actual chocolate, since the chips have a different ratio of wax and other things in them. For the bag of chips, I splurged and went with Ghirardelli’s. The other chips are gross. The espresso powder was a puzzler. I don’t think you can go with actual ground espresso beans, since those are usually not ground finely enough and would give your cookies a weird sandy texture. I went for the cheapest stuff I could find that was some sort of normal “coffee” flavor but still said “instant” on the label. It clearly had a lot of sugar in it; next time I think I’ll check the labels and go for the (a) most coffee-like espresso flavor with (b) the least sugar and (c) with ground coffee as close as possible to the 1st item in the ingredients list.